Imogen Rhia Herrad is a remarkable person. She's German and can speak fluent English, Spanish and Welsh. Once, whilst teaching in a school in Aberystwyth, she learnt of the Welsh in Patagonia and decided to go there. Beyond the Pampas tells of her journeys in Patagonia. In some ways it is a travelogue, in some ways a search for history, but perhaps more than anything else it is a search for self. She sets out with the intention of learning more about the history of the Welsh settlement, and speaks to a variety of interesting people in the Welsh speaking towns. She is happily surprised at the welcome she receives and the way she is included in the lives of the people. Since Imogen is fluent in Welsh, she finds it easy to learn the anecdotes and folk lore of the community - which turn out to be very similar to the ones I'd heard from their English-speaking compatriots. I enjoyed reading about these again (and relieved I hadn't misinterpreted!). However, after interviewing a museum curator who is a descendant of the Tehuelches, the emphasis of her research begins to change. She hears about the life of the present-day indigenous population, and becomes determined to learn more about the remaining Tehuelche and Mapuche descendants who survived the nineteenth century genocide of the 'Conquest of the Desert'. This interest eventually becomes all-consuming, and the book ends memorably. She is invited to a Mapuche religious ceremony on the top of a hillside. It is in part, a ceremony of thanksgiving: the Mapuche are at war with people of European stock, notably big companies like Benetton, for land, and just recently a small battle had been won. Young men ride horses, old women beat drums, wheat and maize is buried in the ground as offering. A Mapuche flag is planted in the soil and the celebration ends with a barbecue - awkward for Imogen because she is vegetarian and so has to survive on bread and tea. She has also had to spend the night badly equipped in a hastily borrowed tent, but she seems to emerge invigorated by the discomfort. She says that if her work is ever published she will go back to Patagonia and bury a copy of her book in the soil. Somewhere in the middle of Beyond the Pampas Imogen reveals that her home life in Germany was an unhappy one. She was abused, and until she made her escape at nineteen, regularly beaten. Since then she seems to have been searching for 'home', and on that hillside in Patagonia she seems to have found it. I raced through this book, and as well as re-awakening old memories of my time in Patagonia, it provided lots of new interest to me too - and was unexpectedly inspiring. talus = sloping mass of rocks or ankle bone. vaporous = filled with vapour, so thin as to transmit light. 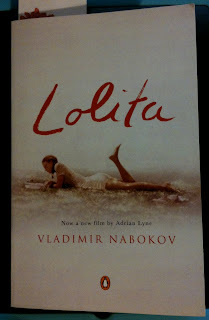 I can see he's a genius, and I really liked a lot of this book - it was witty and the characterisation was excellent - but there was something about it that didn't appeal to me, and it wasn't the subject matter. It seemed to me to be self-consciously clever - more concerned about writing style than communicating ideas and thoughts. I like my prose to be spare and clear, and this wasn't. I'm still really glad I read it, though - philistine that I am. seraglio = living quarters reserved for women and servants in Muslim household. philtre = drink which makes the one who drinks it fall in love with the one who gives it. According to Wikipedia, he was fluent in three languages (French, Russian and English) at an early age because they were all spoken at home. 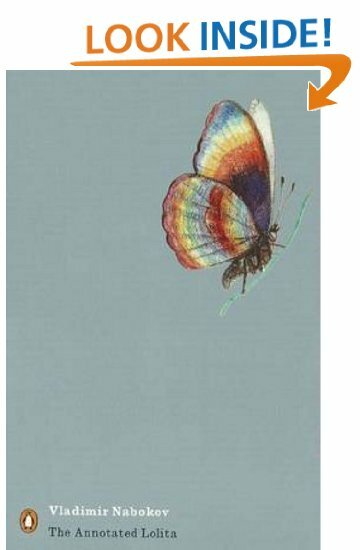 He was also an expert on insects and had a vast collection of the genitalia of a certain blue butterfly because he believed that by microscopic examination of the differences was the best means of classifying them. I expect he would have loved silkworms. Since my TBR pile contains far too many books for me to get through during the day, I have taken to listening to audiobooks in bed, at the gym and whilst doing chores around the house (chiefly the ironing). Most of the time this has worked extremely well - although quite often the books are so good I want to read them on the page too so I can relish them a little more. There have only been a couple of books I have found have not lent themselves to being read out loud: one was Joseph Conrad's Nostromo (unclear narrator), and another was Hilary Mantel's Wolf Hall (partly the indistinct diction of the narrator, and partly I think it is a book that needs to be seen on the page to be adequately processed). Otherwise I think the books have been enhanced by the skills of the actor to speak different parts. 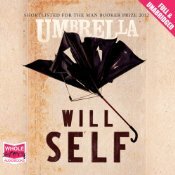 It is quite astonishing how some people can change their voices to convey age and character - which brings me to the book I was listening to last night: Will Self's Umbrella. I heard Will Self read a passage from his book on stage during the Chester Literature Festival, and I was intrigued enough to download the whole thing from audible last month. On the whole, Mike Grady's narration has been great - the different voices helping me appreciate the cleverness of Will Self's descriptions, ideas and language. It also makes what I have heard is quite a difficult text more accessible. In fact I was loving every minute (something I wasn't really expecting)...until last night. Usually I doze off while listening - this is no problem because I can usually work out what I heard last and go back to that the next time I listen - but in the early hours of this morning I woke dreaming I was in the middle of a pub brawl. It turned out I had merely reached part two of the audiobook and the characters were having an Eastenders moment with a very loud difference of opinion. I expect this is great when the listener is awake, but I was asleep, and having been so rudely woken, was unable to go back to sleep again. So from now on Umbrella is one for the gym - or when I'm doing the ironing. and then when each photo is clicked there are step by step instructions with photos. There's even an automatic emailed ingredients list. I think it's a great use of an iPad. 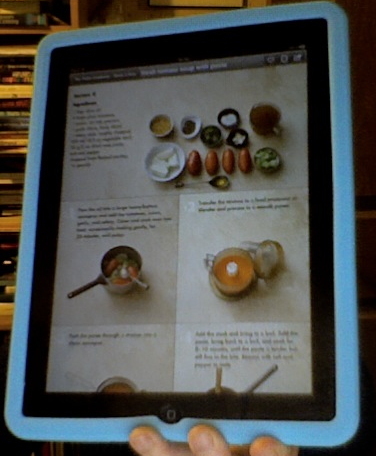 I just hope it doesn't get too filthy (I am a messy cook) - but at least I can wipe it down afterwards. Some time ago, at the invitation of Gregory Norminton, I went to Scotland for the weekend to visit an energy-neutral village. 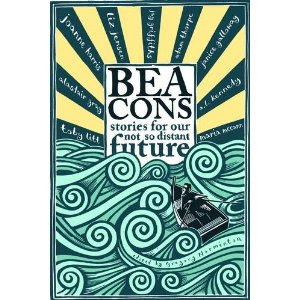 This was part of a project to generate stories for a book called Beacons, published by the excellent and appropriately-named OneWorld, and I am excited to see it come alive on Amazon today (complete with its beautiful cover by Nick Hayes (one of the authors in the book)). All author royalties will go to the Stop Climate Chaos Coalition, the UK's largest group of people dedicated to action on climate change and limiting its impact on the world's poorest people. 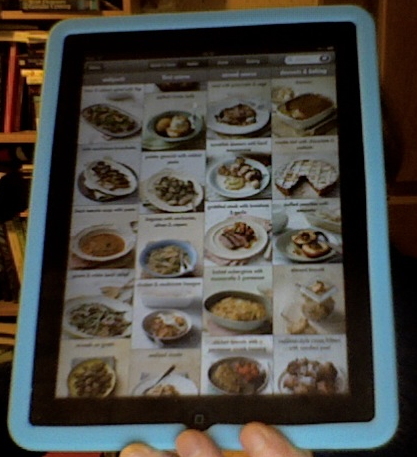 the display on the first generation ipad which I inherited from my father. The display of covers makes the books themselves so much more enticing (more than I think it should), and there is much more of a feel of actually having an object and opening it. Meet Lorelei Lee, native of Little Rock and inveterate gold digger. Men are useful for just one thing: buying Lorelei and her friend Dorothy presents. Over the course of less than six months Lorelei inveigles them into buying orchids, bracelets, soft toys, champagne and, most memorably, a diamond tiara from the unfortunate gentlemen friends who are stupid enough to be taken in by her. As Lorelei says, she has brains, and although some might question Lorelei 's self-assessment, I think she's exactly right. I remember reading once that a man called Howard Gardiner thought there were many sorts of intelligence: kinetic, linguistic, logistic, literate ( I think were some he mentioned), but having read this book I feel confident I can add one more: manipulative. I know lots of people that have it (politicians for instance, fraudsters, magicians and lawyers), and if this sort of intelligence had a scale Lorelei would be right at the top. In the introduction, Anita Loos describes how Lorelei was based on a real person she saw on a train: even though she was not petite men leapt up to help her. It reminded me of an incident I also saw on a train: a young sturdy woman reaching to put a bag on the rack above her head and a handful of men leaping up to help. This woman was not particularly vulnerable, attractive or incapable and yet she had a bunch of male strangers dancing to attention around her - most of them quite uselessly. In fact a couple of them were preventing me from putting my bag on the rack. 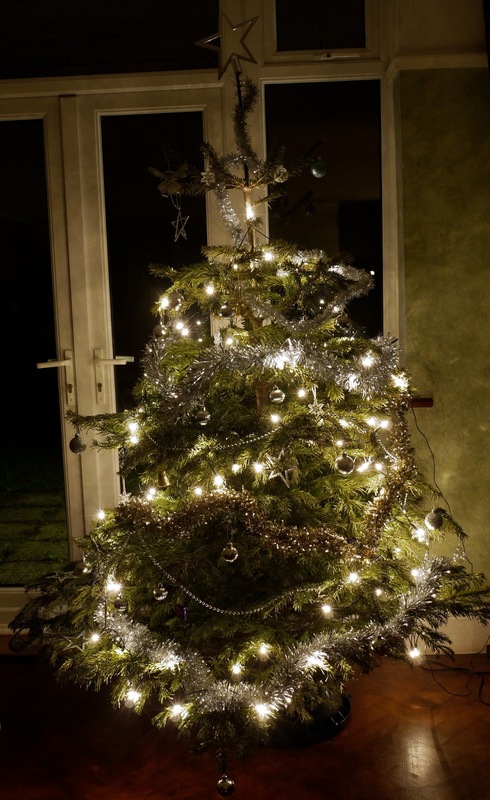 I, much shorter and slighter, struggled invisibly and, of course, unaided... When I eventually got to my place I slyly examined the woman - what was it about her that allowed her to garner such attention? 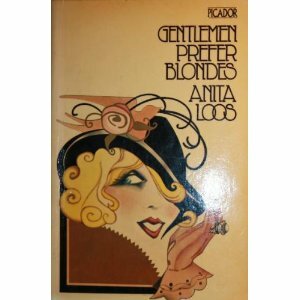 I think Gentlemen Prefer Blondes provides one possible answer. Written in diary form, rather like Bridget Jones's version, it is the tale of how the girl gets her man in the jazz age. Its simplicity is deceptive (as I discovered when I tried to emulate the style) and even though written in the 1920s was just as funny to me reading it almost ninety years later. 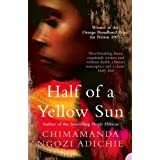 Last night I finished listening to the audiobook Half of a Yellow Sun by Chimamanda Ngozi Adichie and I found it so brilliantly devastating that I couldn't sleep. Everything about this book was perfect: the characterisation, the humour, the sense of place, the plot, the importance of the story - and the audiobook itself (narrated by Adjoa Adoh) was a hugely impressive production too. The book is set during the setting up of Biafra from part of Nigeria. Two sisters - one beautiful, the other sardonic, fall in love, suffer and then struggle to survive in barbaric conditions. 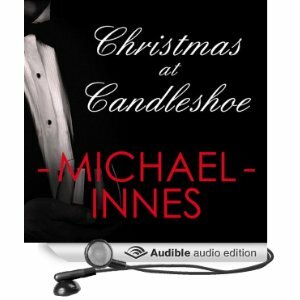 The only 'Christmas' text I had anything to do with this year was an audiobook called Christmas at Candleshoe by Martin Innes. This was a crime mystery which had nothing at all to do with Christmas, a negligible mystery or criminal element but was nonetheless highly entertaining in an arch, tongue-in-cheek sort of way. At three years (corrected later: days, I mean days! 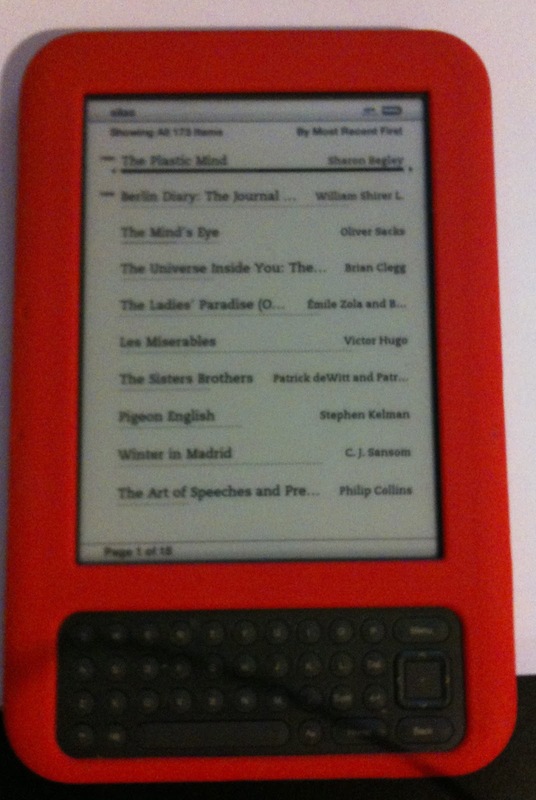 Thanks Cromercrox) into the new year I have already bought eight books - all in the kindle 12 days of Christmas promotion. A mouth-watering selection, I feel. Why do I do this - read five books all at once? The first is an audiobook: Half of a Yellow Sun by Chimamanda Ngozi Adichie a book I've been dying to read for a long time having come across the author give a hugely impressive talk at at a TED conference some time ago. The second is a non-fiction book on my kindle The Mind's Eye by Oliver Sacks. So far it has been dealing with a condition called alexia where a patient suddenly finds himself unable to read. There followed a fascinating discussion on how all human cultures seem to be able to read and that there is a part of the brain, at the back, I believe, which seems to be devoted to the process. Even my nephew, who is badly autistic and rarely speaks, can read and write when motivated to do so. Given that people have only been reading for thousands of years this is unlikely to be due to natural selection and therefore seems to fly in the face of evolutionary theory. Alfred Russell Wallace, Charles Darwin's co-originator of the theory, thought so. But Sachs argues that it is not so. Humans can read because they are using a part of the brain which was evolved to decode clues in our environment. It develops through a lifetime's use, and when a stroke destroys it the result is word blindness. 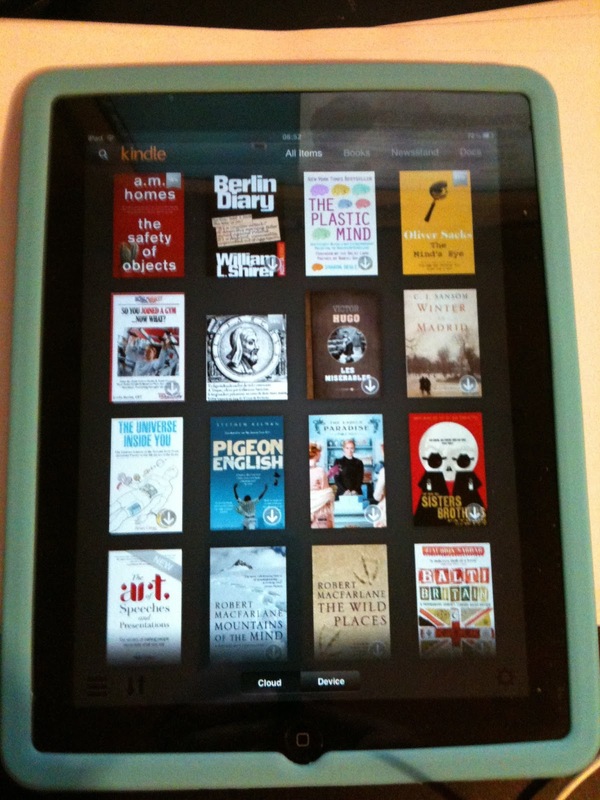 My third is another kindle book bought just out of curiosity: The Safety of Objects by A.M. Homes - a name I hear a lot and have also been determined to read. The first story was spiky and funny. It concerned a couple who watch a documentary about crack cocaine and decide immediately to give it a go. As you would. 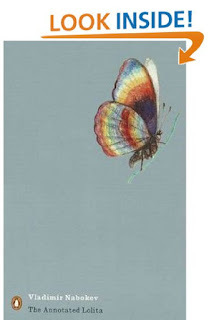 my fifth book: The Vagrants by Yiyun Li. This one of my last books about China and I bought it about four years ago. I recently finished the author's book of short stories A Thousand Years of Good Prayers which won the Guardian First Book Award and enjoyed very much. This seems darker and is based on a true story. In the Spring of 1979, Gu Shan, a twenty-eight year old woman, is executed for her loss of faith in Communism. It follows various citizens of the town on the day of her renunciation and reminds me so far of Jon Mc Gregor's If Nobody Speaks of Remarkable Things - which is odd, I know, because that book uses lyrical language and is based on a street of people in the northern English midlands and features no capital punishment whatsoever. I am not going to resolve to do anything this year, but I intend to finish my novel which today stands at a monstrous 500 pages and, alas, is still unfinished. 'Stop,' I tell it, but it won't. It goes on and on - writhing in subplots and unlikely happenings, creeping into places I've been and others I can only dream about, a thousand years back and then a hundred years forward...slowly, slowly, slowly, word after word after word.